Home / News / NTR, Ram Charan and Arjun Reddy Director teams up? NTR, Ram Charan and Arjun Reddy Director teams up? Sandeep Reddy Vanga shot to fame with the sensational hit Arjun Reddy casting Vijay Deverakonda as the lead. The powerful bold film was applauded by all the top stars of Tollywood. Now the latest we hear is NTR, Ram Charan and Arjun Reddy Director are teaming up for a film. While NTR will play the lead role in the movie, Sandeep Vanga will don the director cap, and Ram Charan will produce the movie under Konidela Productions. The combo news of NTR and Sandeep Reddy Vanga has surprised many, and we wonder what the team has in store. 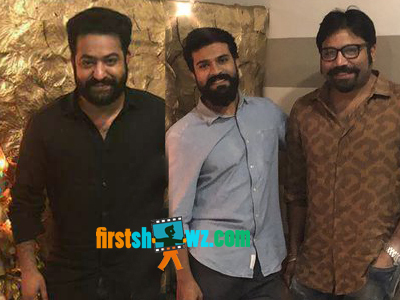 If the buzz is to be believed, NTR happened to meet Sandeep Reddy at a party hosted by Ram Charan and looks like the trio decided to team up. Sandeep has narrated a storyline for which NTR has given his nod, and the Arjun Reddy director is penning the bound script. The film is likely to be a love story and the regular shoot may commence in October 2019, after NTR wraps his portions of for his multistarrer RRR in Rajamouli direction. Stay glued to this space for NTR, Ram Charan and Arjun Reddy Director combo.